OnSong features a large collection of chord diagrams that can be displayed on songs with chords. This editor lets you view chord diagrams, create your own, or manage existing ones. At the bottom of the screen is a tab bar that contains various instruments. Pick from one of the options to manage chord diagrams for that particular instrument. OnSong supports Guitar, 5-String Bass, 4-String Bass, Ukulele, Mandolin, and Banjo. Piano chord diagrams are automatically generated. On the left side is a list of all the chords known to OnSong. You can scroll through this list or use the alphabetic indices on the right to jump to a specific note. You can also use the search bar at the top to search for a specific chord variation. When you tap on a chord on the left, its diagrams will appear on the right in a grid. Tap on the diagram to select it. Once it's selected, you can perform actions on it by tapping on the action menu in the upper right. Tap off the chord diagram or tap on the selected diagram to unselect it. 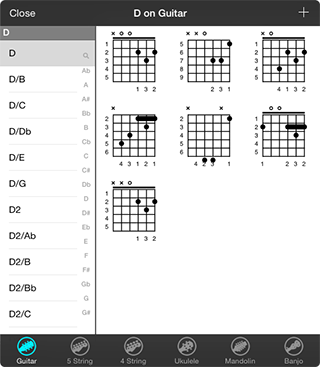 When there is no selection, you can create chord diagrams by tapping on the add button in the upper right corner.